Guess what! 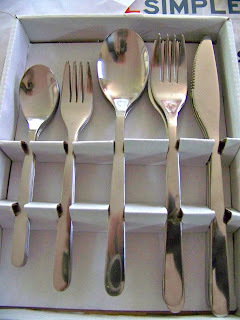 Our pantry hardware just arrived! It's very exciting that we can finally make some major progress with the shelves now that we can actually support them. The progress on the pantry has been quite slow and so to get a little pantry satisfaction, we made a sign for the kitchen. 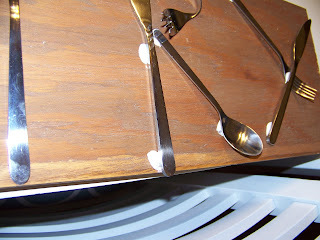 We started with a cheap inexpensive set of silverware from Ikea that I picked up for about $8. Then we busted out the liquid nails. 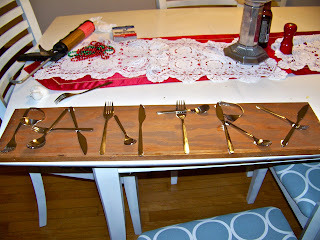 Initially I was going to have out sign say FOOD, but in order to do that, I was going to have to bend a bunch of silverware. 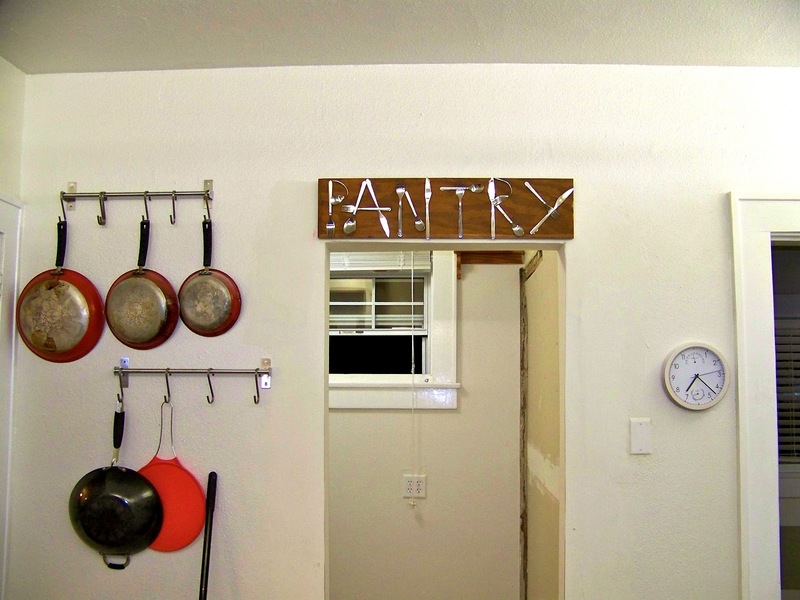 Since this was a little difficult to do, I decided to minimize how much bending I had to do by having our sign say PANTRY. 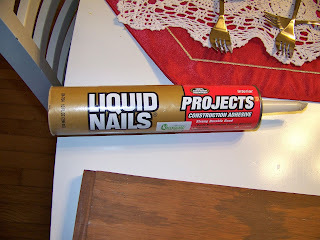 I bent the necessary pieces and laid everything out and then started gluing. 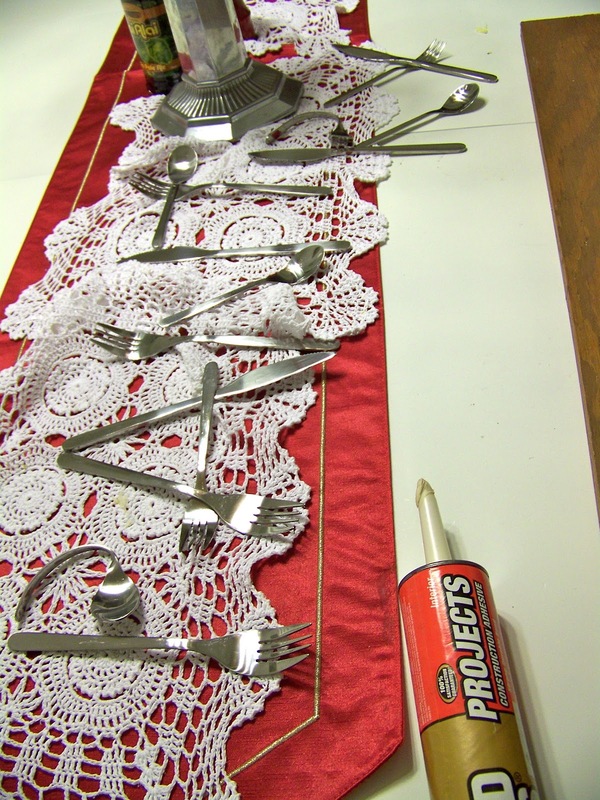 And then placed the silverware in place. It took a few minutes to dry so I was able to move the pieces around a little to get them exactly where I wanted them. 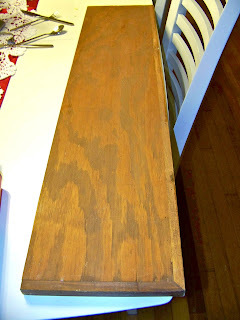 Here you can see how the glue oozed out a little but it wasn't noticeable once it dried. And here it is all hung up. 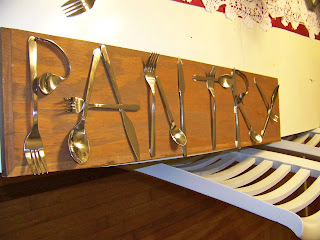 We really like how it turned out and it was really nice to actually accomplish something associated with the pantry! 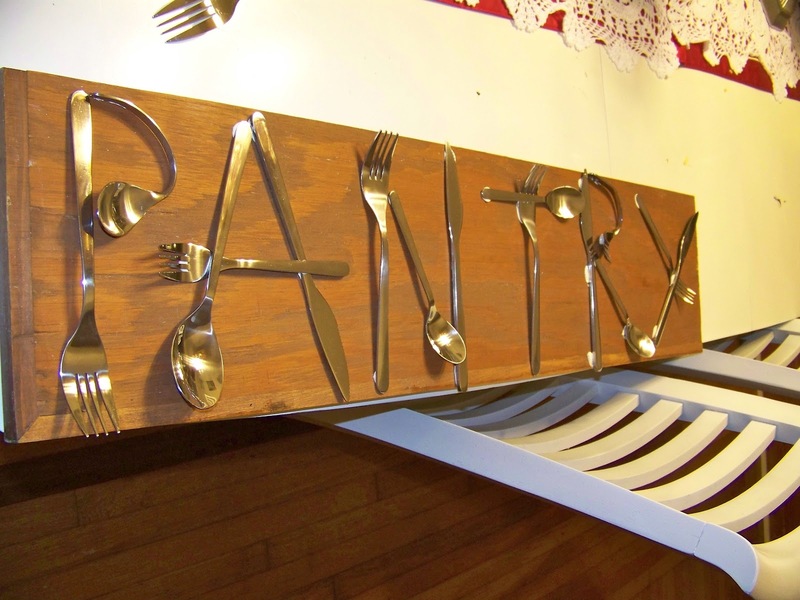 Your pantry sign looks amazing! That is so cool and unique! Awesome! So cute! I love kitchen art. 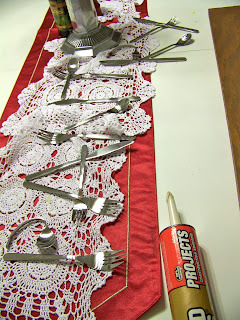 BTW, I found old mismatched flatware (for a project, of course) for $0.19/each at my local Goodwill Store...just an idea for those who want a "vintage" look to their sign. This project is just so brilliant, and wonderfully executed. It's been a while since I have seen something this fantastic. I would smile every time I looked at this sign if it was in my house. I think I might have to make one very soon or something bad might happen. So cool! 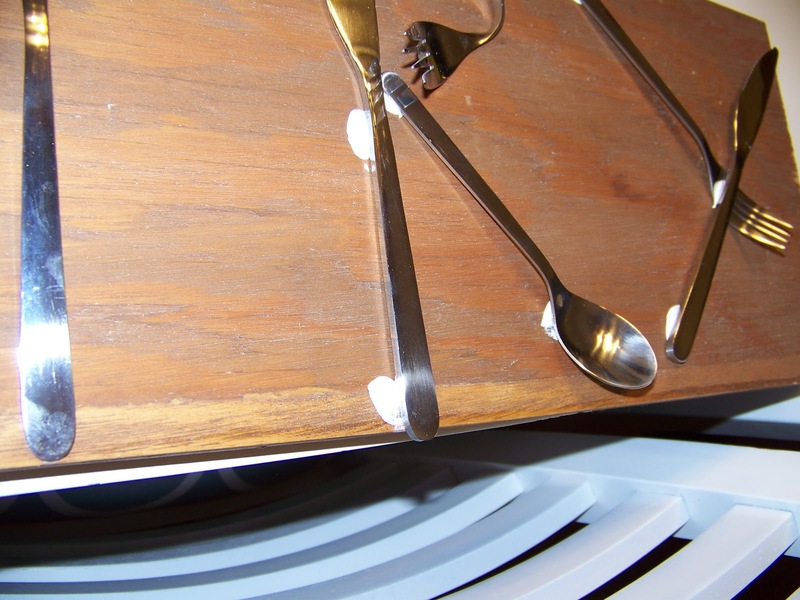 Any tips on bending the silverware? I've wanted to make a craft with bent silverware for a long time but I'm nervous! Thanks! 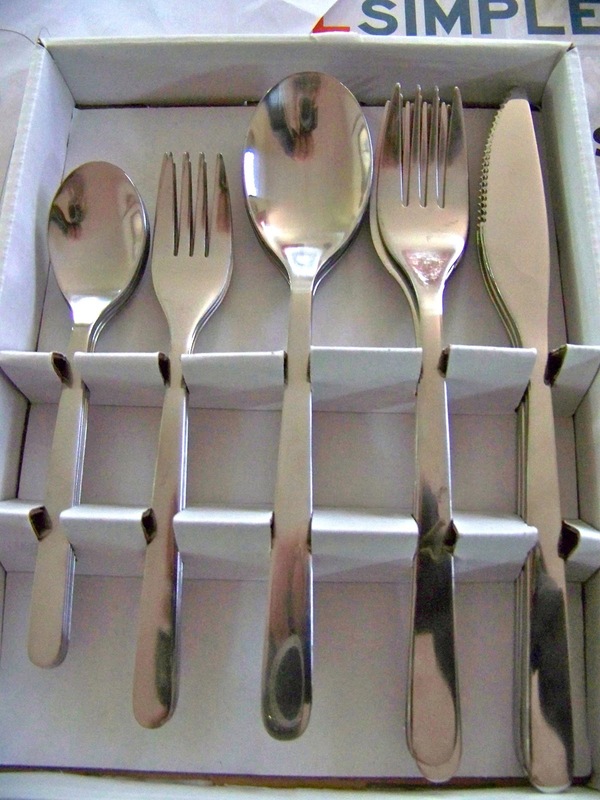 That's actually why I went with really inexpensive silverware. 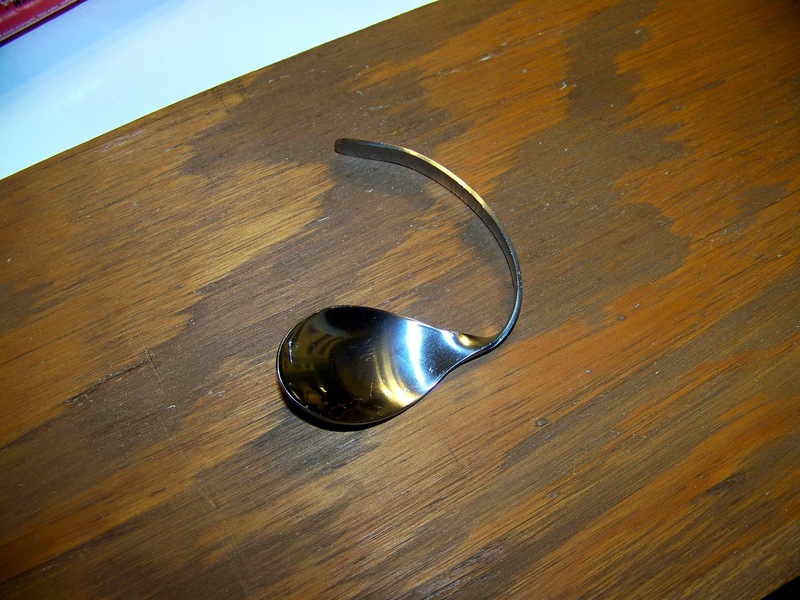 They were pretty easy to bend by hand and then to get the spoon or fork part to face the correct way I hammered the back (so I wouldn't damage the front) until they turned. I tried to bend them the other way with a few different techniques which all failed so this I decided to go the way they actually wanted to bend. What a great sign! Very creative. Your sign is so cool! It looks great! That is so very awesome! Saw you at Manic Monday and I'm following you via linky now. Nice job! Seriously?! This is amazing! You need to sell these. I'm hosting a link party on Wednesday at www.thenymelrosefamily.blogspot.com/2012/03/whimsy-wednesdays-1.html and I'd love it if you linked up. I'm following GFC and LF. How fun! 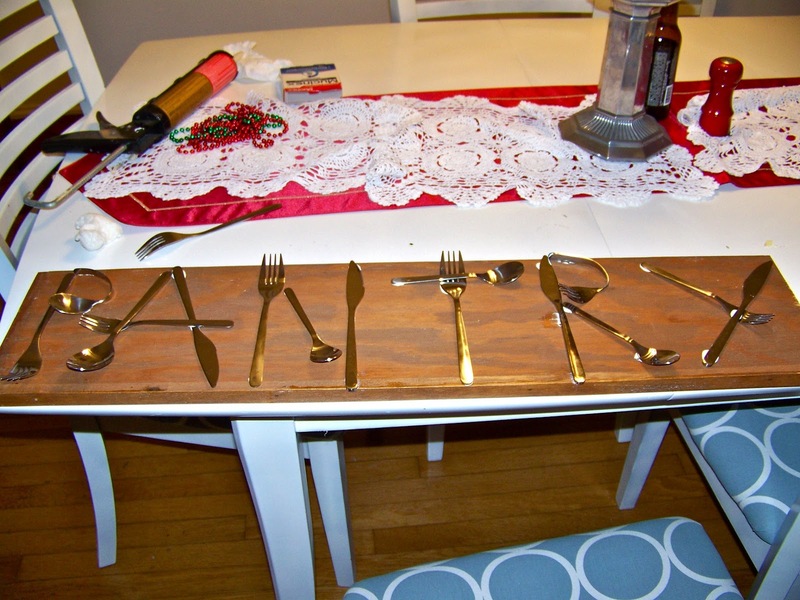 I love how you repurposed silverware- so fitting. Thanks for linking up! 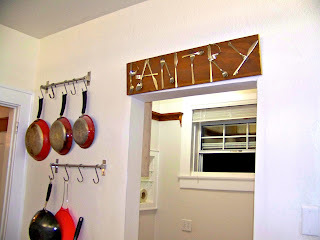 your pantry sign turned out fabulous! 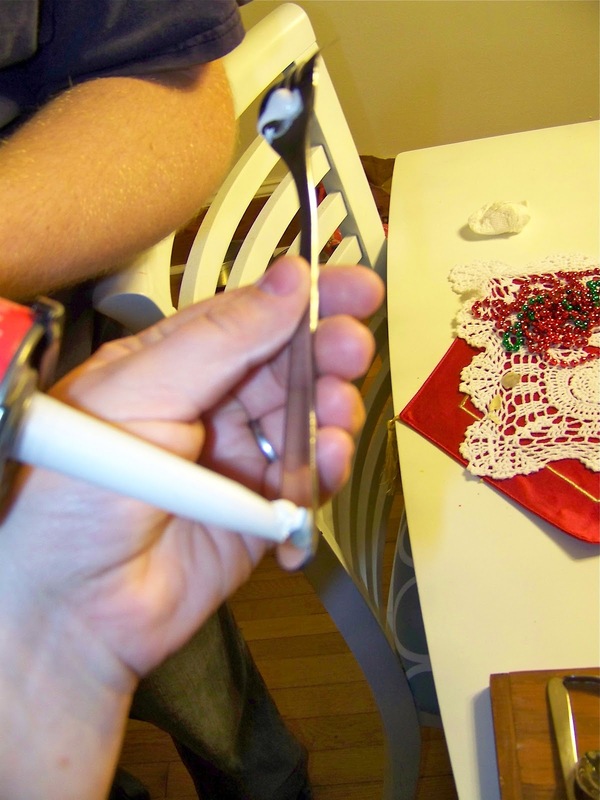 Thanks for sharing the details, and linking up to catch as catch can! i think that is super cute and creative! That's adorable. I love letters and words. I just did my laundry room last week with a sign I posted on my blog too. Mine were just wood though. You're so creative! I loved it the first time I saw and if it's possible I love it even more now! Thank you for sharing at Whimsy Wednesday over at The NY Melrose Family. I can't wait to see what you do next week. That is supper cute and creative!